Hey everyone and welcome back to our blog! Here, we focus on informing our clients and the general public on our favorite painting tips, tricks, and updates. Our painting company services the wonderful homes in the Columbia, South Carolina, area so that our southern city holds true to its reputation of beauty and cleanliness. 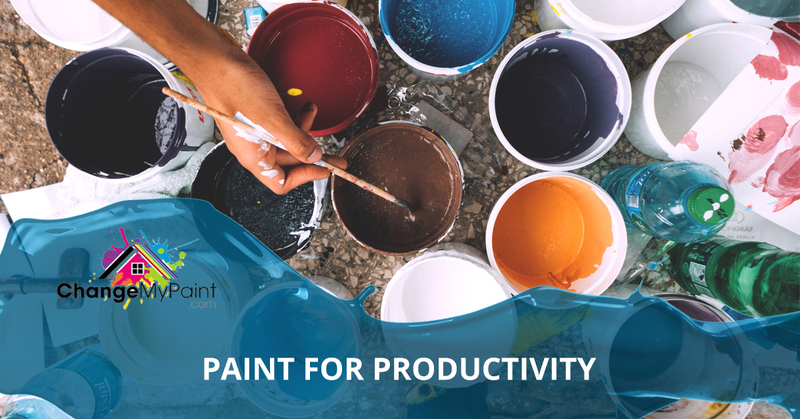 Today, we’re going to chat about how you can use painting in your business as a means to increase profit and productivity. Colors can affect the way humans perceive, act, and feel. Therefore, painting the interior of your business a certain color can help your business succeed. Here are a few colors, according to Quill, that can help your business flourish. The color green is naturally soothing and calming. Have you ever been behind the scenes of a performance and seen rooms colored with green or have just heard the term “green room?” It’s no coincidence. Not only is green calming, but it can also boost creativity in the workspace. Green interior painting is ideal for offices that rely on teammates to produce creative work who might be subjected to stressful constraints, like approaching deadlines. Yellow is reminiscent of sunshine and can be stimulating. Painting the walls of the office a light yellow is thought to inspire a feeling of optimism, which can be especially beneficial if the employer expects a lot from their employees. However, too strong of a yellow can make workers feel anxious and uneasy, so it’s best to stick to the lighter tones. Blue, like green, can be an incredibly calming color. Humans have a natural inclination to be in the outdoors and too much time in an office can be stressful. Blue interior painting is beneficial because it’s similar to the sky and can make workers feel more at ease in the workspace. In addition to blue’s calming abilities, it can also help workers feel more trusting of one another and more willing to communicate. This, in turn, makes a business run much more smoothly and efficiently. Red, unlike the colors mentioned above, has more of an impact on your body’s reaction. Red has a stimulating effect which can increase the heart rate and thus increase energy. Additionally, the color red is thought to activate the brain and boost processing. Because red is such an abrasive color, it’s better to use it to complement other colors rather than paint the entire wall red. Orange is a color that’s good for mood and can make people feel generally happier and more creative when exposed to it. Like red, however, too much orange could make people feel uncomfortable. It’s better to use it as a complementary color here and there! Carolina Painting & Pressure Cleaning specializes in both commercial and residential painting. Our experienced painters can come in and paint your office a beautiful shade of anything you desire. We hope today’s post was helpful and that you’ll have a better insight on what color to go with when coloring your business! Thanks and we’re excited to hear from you!